DUBAI, United Arab Emirates -- After Congress passed a new law allowing Sept. 11 victims' families to sue Saudi Arabia in U.S. courts, opponents mounted an expensive political campaign, including paying American military veterans to visit Capitol Hill and warn lawmakers about what they said could be unintended consequences. What few people knew, including some of the recruited veterans themselves, was that Saudi Arabia's government was largely paying for the effort, worth hundreds of thousands of dollars. Despite a World War II-era U.S. law requiring lobbyists to immediately reveal payments from foreign governments or political parties, some of the campaign's organizers failed to notify the Justice Department about the Saudi kingdom's role until months afterward, with no legal consequences. Even now, some opponents of the law, the Justice Against Sponsors of Terrorism Act, still won't say to whom or how many exactly they paid thousands of dollars each to influence state and federal elected officials on behalf of Saudi Arabia, stymieing public knowledge about the scale of foreign influence on the push to overturn the legislation. The chief lobbyist for the Saudi Embassy in Washington said it encouraged its subcontractors to be as transparent as possible. But the campaign and the allegations surrounding it show what can happen when the often-murky world of lobbying intersects with emotive American issues like patriotism, protecting U.S. troops and the memory of Sept. 11. It also highlights how federal laws governing disclosures of foreign influence in American politics are only as strong as they're enforced. "If the purpose of the statute is to make a public record about how foreign sovereigns are spending money to influence U.S. policy, it's not clear how the Justice Department's relatively lax enforcement of the statute furthers that goal," said Stephen Vladeck, a law professor and national security law expert at the University of Texas. Congress voted overwhelmingly for the law in September, overriding a veto by U.S. President Barack Obama in his final weeks in office. The law, known by the acronym JASTA, gives victims' families the right to sue any foreign country found to support a terrorist attack that kills U.S. citizens on American soil. Its critics warn the law opens U.S. troops, diplomats and contractors to lawsuits that otherwise couldn't be filed under the terms of sovereign immunity, a legal doctrine usually protecting governments and its employees in court. While the bill mentioned no countries, its supporters acknowledged that it took direct aim at Saudi Arabia. Fifteen of the 19 Sept. 11 hijackers were Saudis. 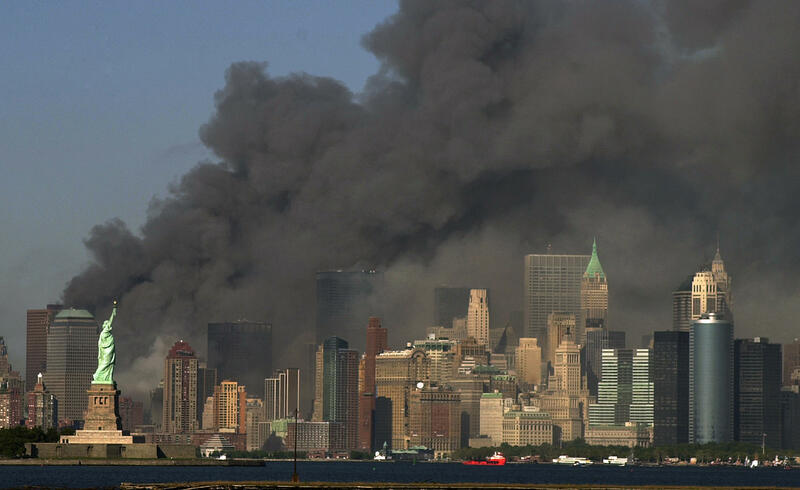 The attacks masterminded by al-Qaida's Saudi-born leader Osama bin Laden killed nearly 3,000 people in New York, Washington and Pennsylvania. The U.S. government's 9/11 Commission's final report said it found no evidence that the Saudi government or officials funded al-Qaida. However, it said the terror group found "fertile fundraising ground in Saudi Arabia, where extreme religious views are common and charitable giving was ... subject to very limited oversight." Saudi Arabia's rulers, who fought a bloody al-Qaida insurgency in the years after 9/11 and who now face another from the Islamic State group, long have denied funding extremists. After JASTA became law, the Saudi Foreign Ministry said it hoped "wisdom will prevail and that Congress will take the necessary steps to correct this legislation in order to avoid the serious unintended consequences that may ensue." U.S. President Donald Trump is set to visit Saudi Arabia later this month. The veterans' lobbying effort began within a month after the vote. Soon, some 70 new subcontractors would be hired by Qorvis MSLGroup, a Washington-based lobbying and public relations firm that represents Saudi Arabia, according to Justice Department filings examined by The Associated Press. Veterans who spoke to lawmakers had their flights and accommodation paid for with Saudi money distributed by the subcontractors, according to the filings. Some stayed at the Trump International Hotel in Washington. Saudi Arabia's involvement was first reported by The Daily Caller, a conservative website, and later explored by the Saudi-skeptic website 28pages.org. One lobbyist involved, Jason E. Jones of Oregon, Wisconsin, told the AP on a conference call he organized with other veterans that all involved clearly were told that Saudi money funded the effort. But David Casler and brothers Dan and Tim Cord, two other veterans, said their first inkling that Saudi money funded the trip was when Jones told the assembled group in Washington that they should speak for themselves and "not the king of Saudi Arabia." They later spoke out on social media over their concerns. "It was very evident that they weren't forthcoming; they weren't telling us the whole truth," said Casler, a former U.S. Marine sergeant. "They flat-out lied to us on the first day with the statement: 'This is not paid for by the Saudi Arabian government.'" A parallel veteran effort involved with Qorvis MSLGroup was run by Scott Wheeler, a resident of Lake Elsinore, California, who runs a political action committee called The National Republican Trust. Wheeler's firm, called the Capitol Media Group, reported receiving $365,000 from the Saudi Embassy in three payments corresponding to visits by veterans to Washington. Under federal law, anyone working on behalf of a foreign government is required to register within 10 days of being contracted and before beginning any work. But in Wheeler's case, a lawyer filed his paperwork on March 31 - three trips and months after being contracted. Wheeler declined to answer any questions about his lobbying work, saying the AP was "perseverating over a non-story." Matt J. Lauer, an executive vice president at Qorvis MSLGroup, said his organization told all its subcontractors to comply with federal lobbying regulations. He said his organization had a long history of filing full reports with authorities on its foreign agent lobbying activities. But those Foreign Agents Registration Act's guidelines, first put in place over concerns about Nazi propagandists operating in the U.S. ahead of World War II, require the Justice Department to enforce them. Between 1966 to 2015, the Justice Department has brought only seven criminal cases involving the act, according to an inspector general report released in September. The report recommended the Justice Department's National Security Division, which oversees registrations, improve its oversight, including making sure filings are made on time. In recent months, the act has gotten more attention due to controversies surrounding the foreign work done by Trump's one-time campaign manager Paul Manafort and his former national security adviser Michael Flynn. But Vladeck, the professor, said more needs to be done to make sure that the law to inform the public is properly enforced. "The whole point is that this (foreign lobbying) is perfectly legal," he said, "but we have a right to know."